Kitaguchi Hongu Fuji Sengen Shrine (北口本宮冨士浅間神社) is located Fujiyoshida, Yamanashi Prefecture. It has the history of 2000 years, and have been visited many people who is going to climb Mt. Fuji since then. It is also the north entrance of Mt.Fuji. It has three sacred trees which are over 1000 years. 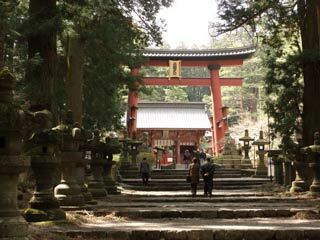 The main shrine was built in 1615 by Torii Naritsugu. It has great leading way with Sugi forest. Enshrines: Konohanasakuyahime no mikoto, Tensonhikohononinigi no mikoto, Oyamazuminokami. Legend says, in 0020A.D., when Yamatotakeru no Mikoto was on his eastern campaign, he visit this sacred spot and ordered to built Torii gate, and gave the imperial proclamation that people should climb up Mt. Fuji from this Torii gate. In 788, the first shrine was built, and in 1615, current shrine was built by Torii Naritsugu. There are many shrines and buildings which remains over 300 years. East Shrine and West Shrine are chosen as the national historic assets of Japan. In 1561, Famous Daimyo, feudal lord, Takeda Shingen built East Shrine and prayed his great victory at the battle of Kawanakajima. Yoshida Himatsuri, the fire festival, is one of three unique festivals of Japan. It is held at August 26 and 27. There are approximately 1,300 Sengen Shinto shrines in Japan. Sengen shrines are centered around the worship of the kami Konohana-no-sakuyahime-no-mikoto, the daughter of the mountain god Ōyamatsumi-no-Mikoto. Konohana-no-sakuyahime-no-mikoto is the kami of Mount Fuji. Due to her fidelity, she is revered as a model for Japanese women. Sengen shrines are found primarily in Shizuoka Prefecture and Yamanashi Prefecture, with a few smaller ones in other areas of the Kantō region and Aichi. Generally, Sengen shrines must be within sight of Mount Fuji, and thus in connection with Konohana-no-sakuyahime-no-mikoto. Where obstructions hinder a direct view of Mount Fuji a Fujizuka or miniature Mount Fuji is erected instead where Konohana-no-sakuyahime-no-mikoto can be worshipped. A Fujizuka may be made from almost anything, but it must contain rocks from Mount Fuji which are believed to be imbued with the spirit or essence of Konohana-no-sakuyahime-no-mikoto. Popular worship of Mount Fuji goes back to the Muromachi period (1392-1573) and has been passed down to today.